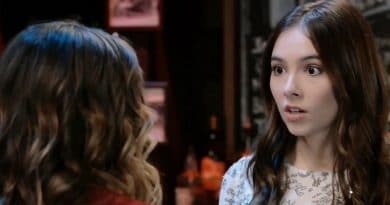 General Hospital spoilers reveal that Willow Tait (Katelyn MacMullen) continues to be distracted by Brad Cooper (Parry Shen), as it looks like she can’t get his baby off of her mind. Of course, Willow believes that Brad’s baby is actually the son she put up for adoption. If she continues to obsess over the baby, will she discover the truth somehow? 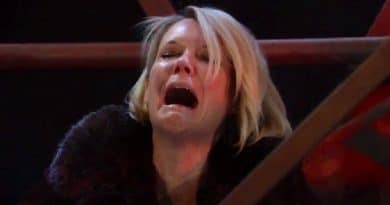 According to recent General Hospital spoilers, fans see Willow Tait is unable to get who she believes is her son out of her mind. Every time she has run into baby Wiley Cooper-Jones, or even just seen the baby, she has had to control her emotions. After all, Willow does believe that she is seeing her son that she gave up for adoption. Of course, Wiley isn’t really Willow’s son — he’s Michael Corinthos (Chad Duell) and Nelle Hayes’ (Chloe Lanier) baby. Willow’s baby tragically passed away on General Hospital. When Brad Cooper stumbled upon Nelle with a healthy baby, they both decided to make a deal and traded babies. Brad desperately wanted a baby for him and his love Lucas Jones (Ryan Carnes). He would do anything to make sure that they created a family, including lying about the truth of what happened with the baby Brad originally adopted. As Willow Tait seems to zone in on Brad Cooper, could she somehow begin to piece together the truth? Brad has been trying to keep the baby secret and not slip up on General Hospital for a while. However, things could quickly fall apart. Plus, now that more people know about the truth of the baby switch, anyone could potentially talk. General Hospital spoilers indicate that the one person who may end up spilling everything is Liesl Obrecht (Kathleen Gati). Liesl helped deliver Nelle’s baby. So, she was originally shocked when she heard that the baby passed away. Wanting to know the real truth, she even went to prison and visited with Nelle, who finally confessed everything. However, Obrecht told Nelle that she would keep her secret — for now. As Obrecht finds herself in trouble quite often, she could use the truth as leverage or as power in a variety of ways. Therefore, it sounds like she’ll keep this secret to herself until she realizes that she could gain something by spilling it. However, that could happen at any moment with someone like Obrecht. At this point, there are more than a few people who could potentially spill about baby Wiley’s true identity. Brad Cooper himself could even spill if things become a bit too difficult for him. But what will the truth do to both Michael and Willow Tait? Michael, for one, will be thrilled to learn that his baby is alive on General Hospital. Obviously, he’s going to be more than a little upset with Nelle and everything that she has done to keep his child away from him. Brad and Lucas, on the other hand, will obviously be broken. Lucas may never forgive him for what he has done, as they both will have to give the baby up to Michael. And then she will finally learn that her baby has passed away. 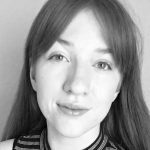 As Willow Tait, who has yet to find out the truth, zones in on Brad Cooper and Wiley, will she stumble upon something that makes her question everything she thought she knew? Make sure you head on back to Soap Dirt daily for all the latest General Hospital spoilers.